Washington Duke was the patriarch of what came to be the preeminent tobacco family in the United States. When the war was over, he headed out on the 134-mile walk home to his farm near Durham, where he began building the tobacco business that would make him and his sons, James Buchanan, Benjamin, and Brodie, famous. The son of yeoman farmers, “Wash” Duke owned around 300 acres of land by the time of the Civil War. He is shown here standing by his tobacco factory at the Duke homestead, now a state historic site. Duke was drafted into the Confederate Army. Upon returning to Durham after the war he had a 50-cent piece, two decrepit mules, and a wagon. He found his farm stripped bare except for a good amount of dried leaf tobacco. He and sons Ben and James B. (“Buck”) prepared the tobacco, packed it in cloth bags labeled “Pro Bono Publico,” loaded the wagon, and headed east to peddle and barter, thus launching the Duke family’s manufacturing career. 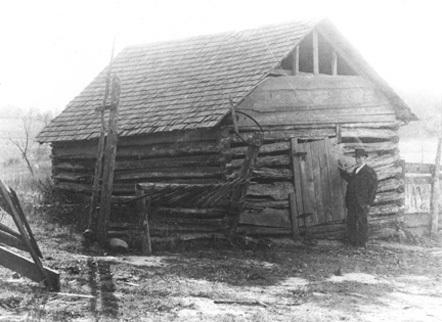 Soon the farm’s production facilities were too small, and Duke moved into central Durham, where he and his sons built more suitable structures to house their tobacco operation. In 1878 the firm of W. Duke, Sons and Company was formally launched, consisting of Duke, his three sons, and George W. Watts. In 1880 Duke essentially retired from the tobacco business and devoted himself to his family, the Methodist Church, and the Republican Party, which he had joined after the war. Unusual for the times, when the Duke family began making money, they donated regularly to various causes, many of them Methodist. When Trinity College, a Methodist school in rural Randolph County, began looking for a new home, Washington Duke offered of $35,000 for buildings and threw in another $50,000 for an endowment. Trinity accepted Duke and Durham’s generosity and opened in Durham in 1892. Washington Duke became the foremost supporter of the school, his donations including a $100,000 endowment offered in 1896 on the condition that women be accepted. He gave to many other institutions in Durham and across North Carolina, including African-American ones, unusual in a time of disfranchisement and Jim Crow laws. In 1924 James B. Duke established a multimillion-dollar endowment for Trinity College and other institutions in North and South Carolina. One of the conditions of the endowment was that Trinity be renamed Duke University in honor of his father, who had died in 1905.